Networked: a (networked_book) about (networked_art) INVITES YOU TO PARTICIPATE: Two years in the making, Networked: a (networked_book) about (networked_art) is now open for comments, revisions, and translations. You may also submit a chapter for consideration. active, aethetics, aggregators, authenticity, authorship, BEN FRY, BEN RUBIN, BURAK ARIKAN, collaborative, communication, data, data mining, digital traces, distributed, DIY, EDUARDO NAVAS, everyday life, flow, GOLAN LEVIN, identity, improvisation, Internet, JANET CARDIFF, JASON FREEMAN, JODI.ORG, JONATHAN HARRIS, latency, lifelogging, lifetracing, MANIK, mapping, MARK AMERIKA, MARK HANSEN, MARTIN WATTENBERG, MAX NEUHAUS, Mechanical Turk, mediation, memory, music, narrative, NastyNets, NATHANIEL STERN, net art, network, NICK KNOUF, nonlinear, OLIVER LARIC, participation, performative, persistance, PETER TRAUB, platform, postmodernism, presentational, privacy, prosumer, prosurfer, ranking, realism, reality, real-time, relational, remix, representation, research, RYBN, SCARLET ELECTRIC, SCOTT KILDALL, SCOTT RETTBERG, search engine, self, self-exposure, SHIFTSPACE.ORG, social networks, software, sousveillance, STEVE LAMBERT, storage, surveillance, tactical media, telepresence, THE HUB, THEY RULE, TrackMeNot, transmission, TV, user-generated, visualization, web 2.0, webcam, widget, Wikipedia Art, YES MEN. Networked proposes that a history or critique of interactive and/or participatory art must itself be interactive and/or participatory; that the technologies used to create a work suggest new forms a “book” might take. In 2008, Turbulence.org and its project partners — NewMediaFix, Telic Arts Exchange, and Freewaves – issued an international, open call for chapter proposals. We invited contributions that critically and creatively rethink how networked art is categorized, analyzed, legitimized — and by whom — as norms of authority, trust, authenticity and legitimacy evolve. Built by Matthew Belanger (our hero! ), http://networkedbook.org is powered by WordPress, CommentPress and BuddyPress. 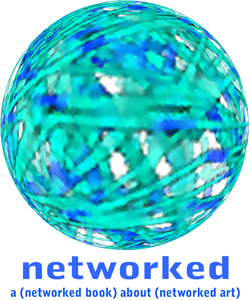 Networked was made possible with funds from the National Endowment for the Arts (United States). Thank you. We are deeply grateful to Eduardo Navas for his commitment to both this project and past collaborations with Turbulence.org.